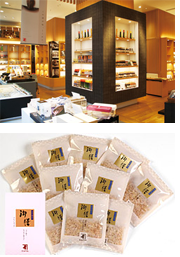 Our shop has specialized exclusively in “katsuobushi”, or dried bonito, since it was established in 1699. Around 1830 we issued gift certificates made of silver to exchange for katsuobushi, which is presumably the oldest in the world. Katsuobushi is a fermented food product made from dried fish, the same as cheese or yoghurt and it is also known as the hardest foodstuff. To eat katsuobushi, it must be shaved in much the same manner as you shave wood with a plane and katsuobushi shavings are an essential topping for tofu dishes or boiled spinach flavored by soy sauce. Soup stock made by boiling katsuobushi is used variously, for soba noodles, light soups and boiled dishes. So it is ranked as the most important soup stocks with shiitake and kelp soup stocks in Japan. High in protein and low in calories, katsuobushi is an essential ingredient in Japanese cooking.